Spam has become a four letter word in our society. Within Social Media, the term has transcended most understood meanings to become a universal description of anything an individual doesn’t like within a social network. This challenge for some has given rise to tools such as TrueTwit, which attempt to remove that frustration that people have created, bought into or truly believe they have. Yes, I know I am sounding a bit negative and many of you are seething inside, ready to unleash your proper etiquette stance within my comment section. I realize there are two staunch camps out there in the social media space. One that has no care or concern and will do whatever they can to market and make money. The other camp is largely comprised of purists that state any automation or tool outside of a keyboard is a sin inside of social media. Let me try and take the middle ground here and question the use of said tools and why I am very close to no longer validating myself. 1) For the few, the many: Yes, I tend to be on the conservative side of things. I have a real problem when the many have to pay for the actions of just a few. This is exactly how I see this debate. Why am I being penalized when I am not the bot? 2) My time over yours: How come I have to spend 20 minutes a day validating myself when I am the easily validated human being? Why wont you take the mere seconds necessary to view my bio and timeline, let alone Klout score? 3) Reciprocation: I painstakingly review every persons bio before I follow them. I also review their bio and timeline whenever I engage with them. Why? So I get a sense of who they are, how I can help them and what their interests are. This shouldn’t be a rare thing you do, it should be an always thing you do. 4) Just plain lazy: I got to tell you. I have never had any problem identifying a bot, nor has any bot on Twitter ever harmed me in any way. First, why are you afraid? Secondly, you are starting a relationship with your followers based on distrust, not trust. Do you know of any effective relationships that work out well on that foundation? Finally, here is where I sum it all up. I can’t recall too many people I followed that use TrueTwit and have been all that engaging, effective or someone I promote. Again, no hate mail, just listen to one persons point of view and consider how you are starting relationships within the social graph. For these and other reasons, I am now seriously considering saving my 20 minutes per day validating as I am. I think that time could go to better uses engaging with people that understand social media enough to build relationships not focus on “bot-free” followers. Robert, this is brilliantly summarized and I am 100% with you on this. I am sick of it and I stopped validating weeks ago. It’s lazy, spammy to me, and wastes my time. Let’s start a boycott today. I would rather not boycott, as I am not big on the whole “demonstration” thing when it comes to business stuff. I prefer to educate and provide ideas that get people to think about what they are doing. To consider things they maybe had not. This way we can lead! You’re the best man. I appreciate your input always! I agree with a lot of your points. I remember reading another blog entry that stated that TrueTwit tries to avoid spam but the automatic messages sent to new followers could easily be considered spam as well. I also agree that it does not take long to check out someone’s bio and recent tweets to decide if they are a bot. Great post! Three cheers for Reciprocation…down with auto-replies ;) A wise man I once knew hated when people were late for appointments. He would say “why would they assume their time is more important than mine”? He wasn’t being arrogant; he just wanted mutual respect. Excellent! One of my BIG peeves is tardiness. Nothing says disrespect than being late for an appointment. Agreed; I find the service to be an almost offensive feature that dissuades me from engaging with the said Tweeter. Usually if I get a request to validate I stop the conversation right there and move on. I know it’s frustrating… I find that most aren’t trying to be lazy, they just don’t understand social media well yet. I try my best to be patient and give them a chance, albeit frustrating at times! Thanx for jumping in on the subject! Thank you for this most wondurfel post with so many things I have been thinking of but put by you so excellently well. :) You are right on. Automated, no matter what side of the equation, is not social. You have to do it yourself. I dislike TruTwit almost as much as I dislike those who protect their tweets. The basis behind Twitter is freedom for any account to follow any other account, and that includes bots and other spam accounts. I consider it the price of freedom. I then have freedom to choose not to follow back. It’s a beautiful thing. For that reason, I feel any type of restriction goes against the fabric of this social network. I hear ya Cynthia. My view is anything outside of Spam is a personal choice. I try to share my thoughts and experience related to getting better results and providing value to followers/fans. If someone wants to protect their tweets that’s great. Twitter is a great way to stay connected to only specific friends. That’s great too! Someone may have a stalker yet still wants to enjoy the fun of twitter, they should be able to. I advise against protecting tweets if you are going to gain any reach or audience, but who knows what someone would do it. I find a lot of times people just don’t understand certain aspects of social media and that is where they miss. Rarely is it an intentional wrong doing for evil purposes. Bots can get through TrueTwit now, so it is no longer effective anyway. The only thing it was effective at is limiting your reach, alienating potential followers and starting a relationship without trust. Oh and removing the responsibility to actually look at a followers profile and what they are tweeting. I’ve written many times about all the things people do wrong on Twitter. If you look at the people that use TrueTwit, their numbers are usually disproportionate. Don’t make me work to follow you. Don’t create barriers to engagement. We’re a society of quick action and instant gratification. If I don’t get it and you don’t want to provide it, I don’t follow. P.S. I love Twitter and I welcome a lot of people into the fold but I refuse to use TrueTwit. But how to you REALLY feel Fadra? :-) Love it! Thanx for jumping in hun. Seriously, it takes two seconds to figure out if an account is a bot. How lazy can you get? I probably get 10 per day of these Nadia. I take it in stride. Most use it out of laziness or primarily ignorance of social media. I try to be patient and teach but is very frustrating at times. Thanx for the input! After being True Twitted repeatedly lately, I was just putting together a blog about it, and auto following, and how those “services” detract from the whole Twitter process because it’s quality that counts, not unproductive quantity when all is said and done. And here I stumble upon this brilliant post! Thanks so much for it, and I hope you don’t mind my referencing it in my own blog (with full credit, of course). Ty so much! Im honored you want to share it. Feel free. I do see that that post is more focused on my blog’s topic; I hadn’t seen it before, and I thank you for pointing me to it. But I was trying to weigh in on the march toward automation in social media marketing, and its overall effect on quality of audience building vs. massive quantities of essentially empty followers. Maybe I should have used a different title. TrueTwit is an integral component of the whole automation movement, which grew out of the perceived need to mass produce followers in order to look good for clients. Don’t get me wrong — quantity IS important. But to a point. As I continue learning while building my business, I see many blog posts addressing the experience of clients whose initial thrill over their surging numbers of followers has turned to ire when those big numbers don’t yield productive business. To me, that in turn causes a potential risk of undermining the validity of the social media marketing industry. And again to me, it ultimately makes our job more time consuming and labor intensive. You have to pay to play eventually! Even with inputting search parameters into automated follow/followback programs, the results too often cast such a wide net that we need to wade into the masses and cherry pick who really has potential business worth to our clients. And in true circular fashion, this is what has given rise to MORE automated programs, like TrueTwit. In my estimation the resulting impersonalization is counterproductive to engendering the kind of interactive relationships that turns followers into clients. Well we disagree here a bit. 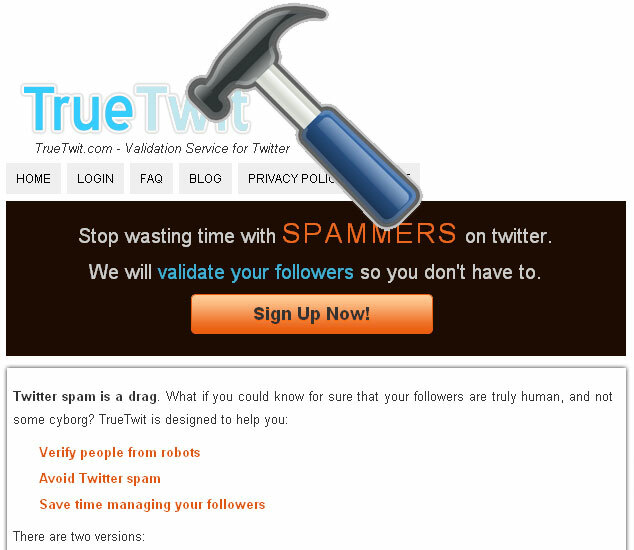 The last thing TrueTwit is, is a tool that will mass produce followers. It’s design is intended to weed out bots and fake accounts and therefore reduce spam, etc. There are many things that can/should be automated to have an effective social media program and targeted community. Anything that helps you find your audience and content I am highly supportive of. Anything that automatically posts or follows, I am NOT a fan of. Again, I fully understand and support the reason for its existence. My point is if it weren’t for the auto follow and auto post programs, chances are TrueTwit would not exist! There probably wouldn’t have been a need for it. I do see its value as a tool to help sift through all those auto follows…but it also adds an unfortunate level of impersonalization, which is not very good when you are attempting to build a relationship with a potential client. Robert – brilliant as always. I completely agree with you. Your insights and your personal coaching have made a big difference. Many thanks in this Thanksgiving week and beyond! Wow Debby, I am honored, thank you for the kind thoughts.